An important contributor to French painting of the mid/late 19th century, Manet was the first major artist to introduce unequivocally modern art to the French public. His landmark female nudes - namely, Le Dejeuner sur L'Herbe (1863) and Olympia (1863) - both of which were rejected by the official Paris Salon, made him the unofficial leader of the avant-garde and a revered figure for the group of young Impressionist painters who were still struggling to make a name for themselves. In this role he fulfilled a key role in the transition from Realism to Impressionism (c.1830-1900), although he never showed at any of the Impressionist Exhibitions in Paris (1874-86). In return, the Impressionists' use of bright colours and loose handling rubbed off on Manet's own work, while Berthe Morisot - who married Manet's brother Eugene - was instrumental in persuading Manet to adopt the plein-air painting methods used by Monet, Renoir, Sisley and others. Of all his works, The Road Menders is the most Impressionistic in style, although as we shall see, it was not a spontaneous work. Manet painted the view depicted in The Road Menders from his art studio at 4 Rue de Saint-Petersbourg looking along the Rue de Berne (then the Rue Mosnier) to its intersection at an oblique angle with the Rue de Moscou, on several occasions during 1878. Apart from this version, the other views of the road show it decorated with flags for the first Fete Nationale held in France since 1869. One of these pictures (Paul Mellon Collection, VA), shows the street almost deserted except for a one-legged man on crutches, a war-invalid, who serves as a reminder of the Franco Prussian War (1871) and the Paris Commune. For The Road Menders, Manet made two peliminary sketches - see, for instance, Rue de Berne (1878, pencil and wash on paper, Budapest Museum of Fine Art) - as well as separate oil sketches of the cab and the figure in front of the lamp post. This careful preparation is then combined in the final painting with an Impressionistic technique which suggests spontaneity and is concerned with conveying an overall effect rather than precise detail. The bending figures of the road-menders in the foreground, for example, are indicated with a few strokes of the brush. Interestingly, none of the seven workmen are individualized - compare this with The Stone Breakers (1849) by Gustave Courbet - or imbued with heroic significance - compare Man With A Hoe (1860) by Jean-Francois Millet. They are merely one anonymous element in the totality of the street. Although Monet's 19th century colour palette is noted for its dark colours, The Road Menders is executed with a very light palette - even the dark colours are imbued with light. And there is a noticeable unity of colour: the blue of the workers' clothes is reflected also in the street surface, the shadows, and the moving van, as well as the shutters and balconies of the building on the right. Meanwhile, the green on the fence to the left is echoed on the roof of the cart and in plants on the right-hand building facade. Certainly all trace of the sombre tones of Spanish painting, by which he had at one time been attracted, has disappeared. 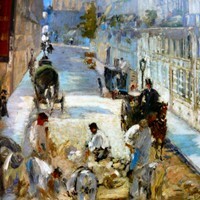 As mentioned above, despite the Impressionistic style of the painting - in particular, the rapid brush strokes used to depict the forms of the workmen, the two figures on the pavement (left foreground) and the green foliage of the tree (right background) - the composition was basically built up from Manet's earlier sketches and drawings. Thus what appears to be a spontaneous plein-air work in the manner of (say) The Beach at Trouville (1870), by Monet, is in fact carefully and deliberately constructed from prepared drawings. Nevertheless, the overall effect is emphatically that of a snapshot, not least because Manet does not allow the eye of the spectator to focus on any single element in the picture. Only the top hat of the carriage-driver (right foreground) represents a possible stopping point. In this sense at least, the painting provides us with a wonderfully fleeting impression of life on the streets of the French capital. The billboard advertising beer on the end of the left-hand row of buildings was intended to be seen by train passengers leaving the Gare St Lazare. The open area behind the fence at the left of the painting is not a building-site, courtesy of the Haussmannization of Paris, but railway land, the cutting visible behind the figures in The Railway (1873, National Gallery of Art, Washington DC), and a reminder of the proximity of Manet's studio to the station and the railway tracks. Manet produced many memorable images of Parisian life from his picture of Le Skating to the final triumph of A Bar at the Folies-Bergere, but as an outdoor scene The Road Menders is unsurpassed, conveying the very essence of a Parisian street and bringing into relation the Proustian elegance of some wealthy person's carriage and the group of proletarian workers, without the least social comment, but with an 'instantaneous' realism that goes beyond the camera.  Luncheon Of the Boating Party (1880-81) by Auguste Renoir.